Hi everyone! Summer is right around the corner, and nothing get’s me as excited as getting ready for our church’s VBS every year. We have done several themes over the years, but I think this year we plan on doing a Space theme! I like to get started early with my ideas and test them out. 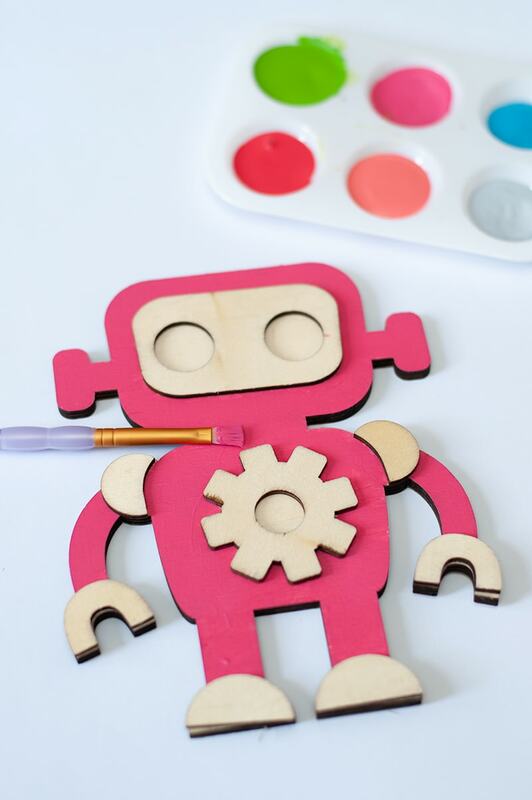 One of the ideas I decided on were these wooden robots, after I saw them on the Darice site. 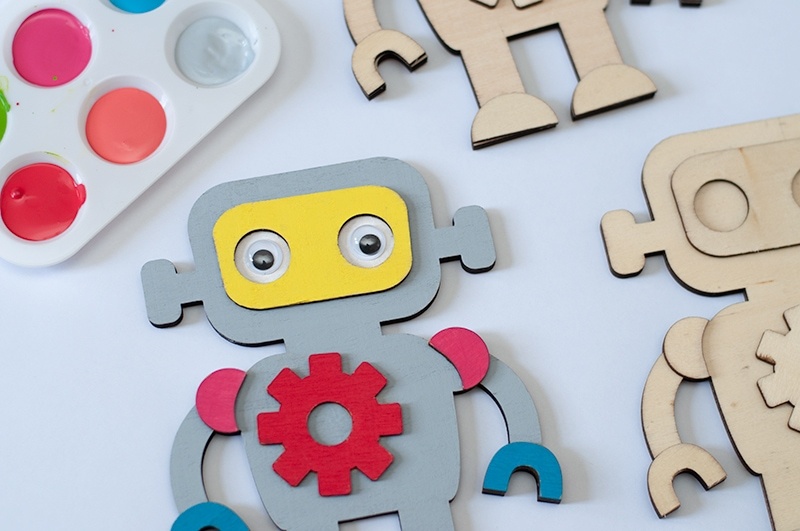 This wooden robot craft is a great/easy project for kids of all ages to do. Plus you only need a couple supplies, which is great for a VBS craft. We usually get about 150 kids, so to be able to check an easy craft (yet cool) project off the list is always a great idea to me! 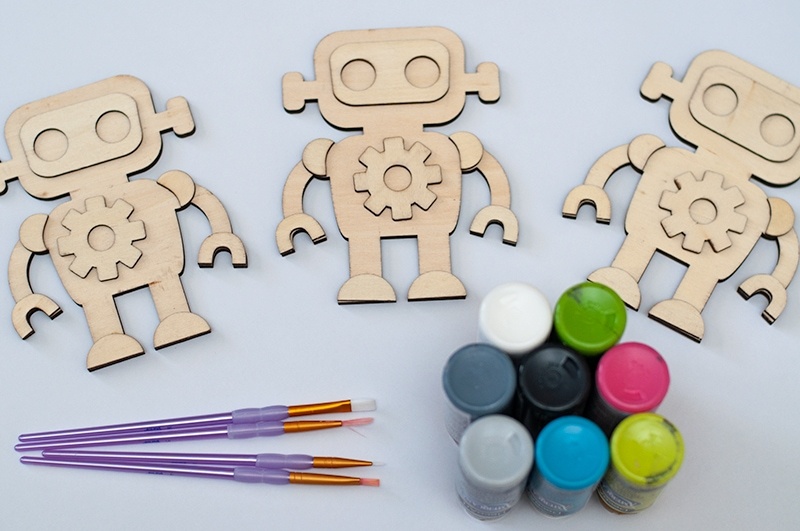 Quick Tip: Have the kids or helpers write the child’s name on the back of their robots. 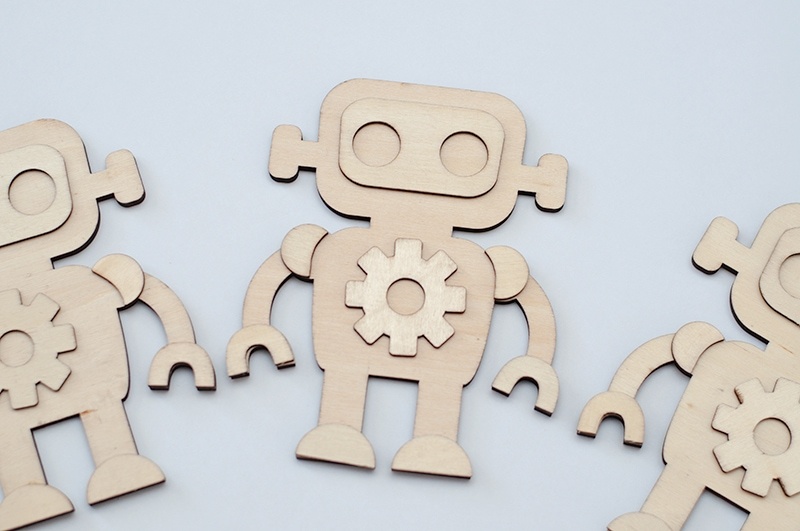 This will make it easier to identify which robot belongs to who. Step 1. 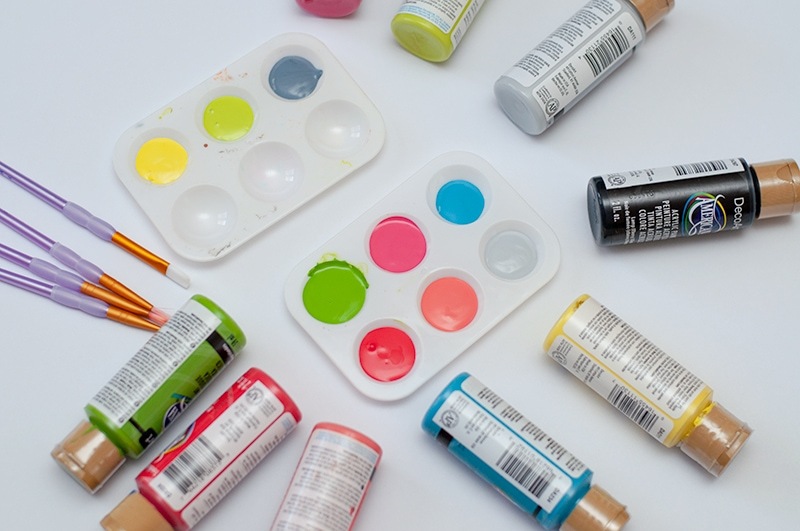 Start off by selecting a TON of paint options for the kids. I always just use a basic acrylic paint for any of my VBS projects. Remember a little paint goes a long way with a project like this. Step 2. Make sure to have several different size brushes for the kids to use. If you invest in good brushes they will last many years, if you make sure to clean them right away. I keep a cup of water on the table for the kids to add their brushes to once they’re done so the paint does not dry on them. If you have helpers, then they can walk around and clean the brushes after each group leaves. Step 3. The fun part, letting the kids start painting! With this craft, I would have the kids paint the body first, then start painting in the details. Tell them to get as creative as they want with their robots! Step 4. As you can see I was planning on just painting in the eyes, I was not a fan of that look. So I grabbed some goggly eyes and some glue and added them on. A way better look, and really finishes the project off nicely. 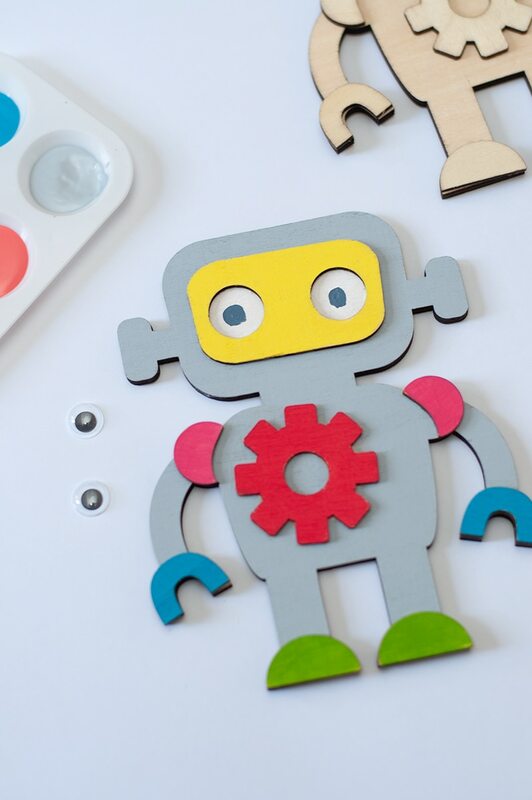 I love adding all the different colors to these robots! I also found these great Space Stickers you can use with this craft. 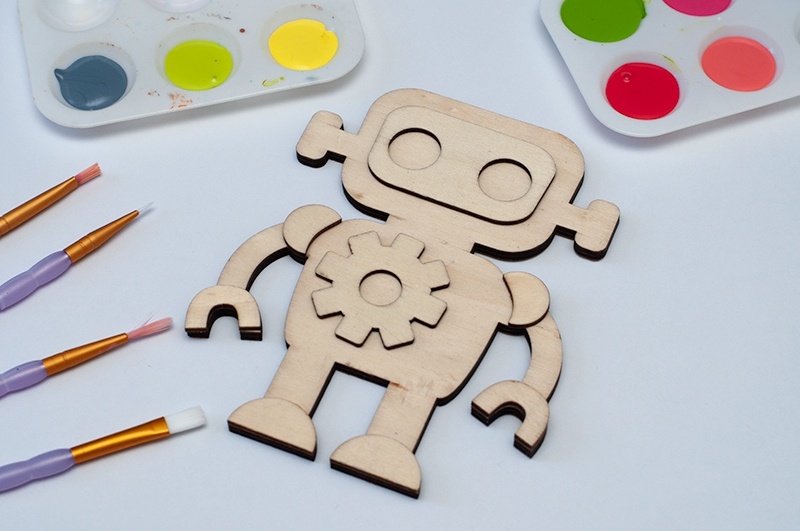 Now they have a cute wooden robot project they can bring home and display in their room! Thanks for stopping by, I hope this craft inspires you if you’re doing a space theme VBS this year! This would also work great, if your doing a Space theme Summer camp as well. If you ever have any VBS questions or need tips, I’m your girl. Shoot me a message and I’ll help any way I can! This will be my fourth year doing crafts for VBS and I have a pretty good system.